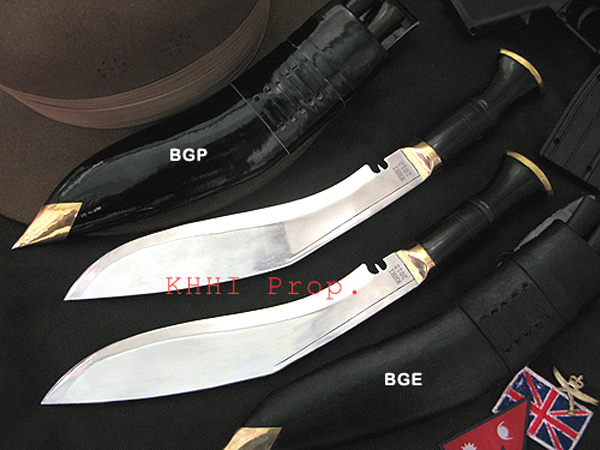 Both Gurkha kukri Knives are original and made by KHHI for the official "Recruit Intake 2012" of the Brigade of Gurkhas of the British Army.. Price includes both knives. 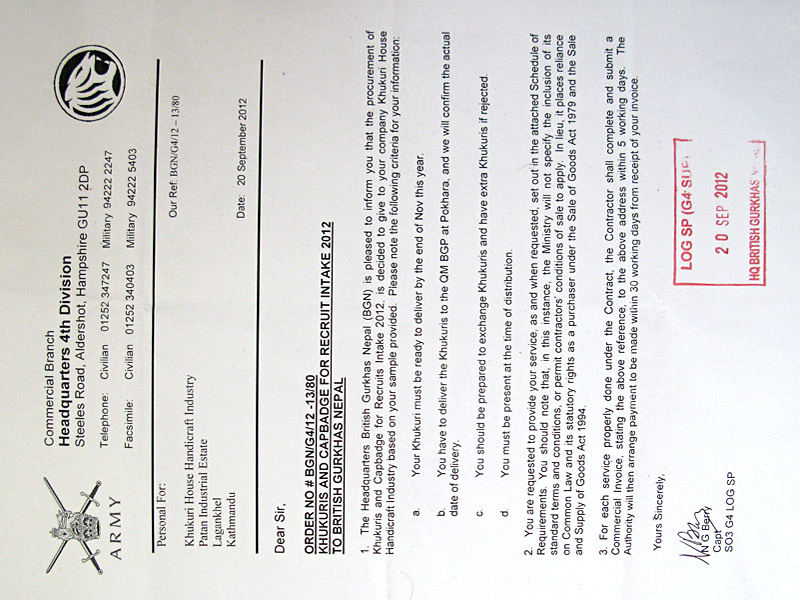 In the long tradition of BGN (British Gurkhas Nepal) where an annual tender is done every year to appoint an official maker/supplier for its new recruits for that particular year, KHHI has successfully won the annual contract for various years and once again we are extremely pleased and honored to announce that we have been selected for the year 2012. KHHI’s high quality kukris and its professionalism into the business beat all in the race and BGN officials were so pleased with the product and price that they decided to handover the contract to KHHI. Now KHHI will be supplying a total number of 252 pieces for the “Recruit Intake 2012” in which each recruit will be issued with 2 khukuris. KHHI is very delighted, privileged and further motivated to be appointed as the official maker and supplier to the legendary British Gurkhas for the year 2012. We would like express our deep gratitude and gratefulness to all our well wishers, supporters and customers without whom KHHI would not have come this far. We would also like to thank all BGN staff for giving us this opportunity to serve the Gurkhas. We have also decided to open the kukris for the general public acquirement. A few extra of the same standard issue kukris that are made for the contract are available for purchase. and the other is the Service No.2 or the Exercise knife (British Gurkhas Exercise, BGE). 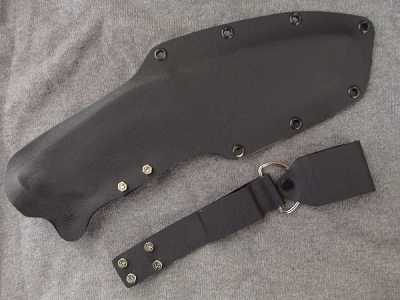 Both blades are exactly the same and almost identical to its original version issued in late 1980’s called the “Service No.1 (Sarkhari Kukri)”, however slightly thicker and wider thus heavier and the shape/curve differs marginally (not noticeable to a general eye). Similarly the brass bolster has lips slanted to the blade unlike the original and 2009 issue. Both blades are well polished. The rest features are exactly same as its earlier counterparts. The only thing differentiating Service No.1 or the Parade knife (BGP) and Service No.2 or the Exercise knife (BGE) this time in 2012 is the scabbard it comes with. BGP has shiny patent leather sheath (see photo) and hence carried for parade, on duty and on ceremonial occasions where as BGE has Normal black leather sheath (water buffalo hide) and hence used as a tactical knife and carried for training, exercise and even for combat. Both Gurkha Knives are original and made by KHHI for the official “Recruit Intake 2012” of the Brigade of Gurkhas of the British Army. Weight: 600 gms (blade + handle) approx. Overall Weight: 775 gms approx. 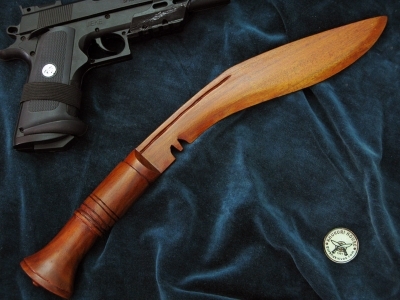 Enclose: Both come with a frog, brass chape and two accompanying knives (Karda Chakmak), each blade is stamped with "KHHI 2012"
Assuming high number is better? I am assuming a 5 is better than a 1, but didn't see an explanation of the rating system. I bought this set in 2012 and have been very pleased with the quality of these knives. Highly recommended. I bought the 2013 set, too.